Publix and Walgreens anchor the Windsor Commons shopping center. JACKSONVILLE, FL—The anchor of a south Jacksonville shopping center has acquired the complex in a deal reportedly valued at nearly $22 million. An entity of Lakeland, FL-based Publix has acquired Windsor Commons, a 78,729-square-foot shopping center, which is also anchored by Walgreens, for $21.5 million, according to the Jacksonville Business Journal, which cited a recent deed filing for the purchase price. Brokerage firm Holliday Fenoglio Fowler, L.P. marketed the property on behalf of the seller, a global investment manager. Publix purchased the asset free and clear of any debt. Multiple published reports state the property was purchased from a subsidiary of DWS Group’s RREEF Property Trust, which is based in Chicago. Completed in 2000, the center is situated on 9.86 acres in south Jacksonville at 4765 Hodges Blvd. at the heavily trafficked intersection of Hodges and J. Turner Butler boulevards, which exposes the center to a combined 141,000 vehicles per day. The HFF investment advisory team that represented the seller included senior managing director and co-head of HFF’s retail practice Daniel Finkle, managing director Luis Castillo and director Eric Williams. Publix is privately owned and operated by its more than 200,000 employees, with 2018 sales of $36.1 billion. Currently, Publix has 1,215 stores in Florida, Georgia, Alabama, Tennessee, South Carolina, North Carolina and Virginia. 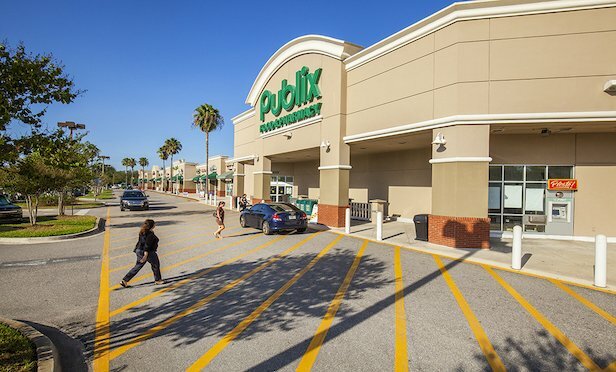 Last month, Publix opened new store locations in Clarksville, TN (47, 260 square feet); Charleston, SC (52,606 square feet) and Delray Beach, FL (45,600 square feet). In a GlobeSt.com interview, Michael Sheinkop, president, brokerage recruiting and acquisitions at Newmark Knight Frank, shares what went into acquiring the Wisconsin brokerage.